Make yummy snacks for all the ponies. Special pony charm. Ponies from all over Ponyville come to the Cotton Candy Cafi for tea parties and ice cream. When Cotton Candy touches the cash register, it opens. The oven door opens to magically reveal a pie. 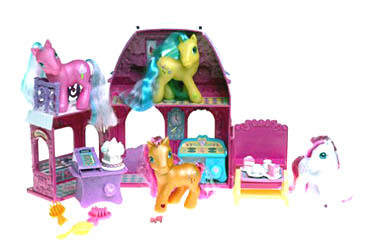 Playset includes Cotton Candy, Meadowbrook, Sparkleworks and Star Swirl Figures, cash register with cotton candy tray, 2 cake slices on plates, 2 teamcups and saucers, table, oven 4 brushes, charm and friendship ribbon.